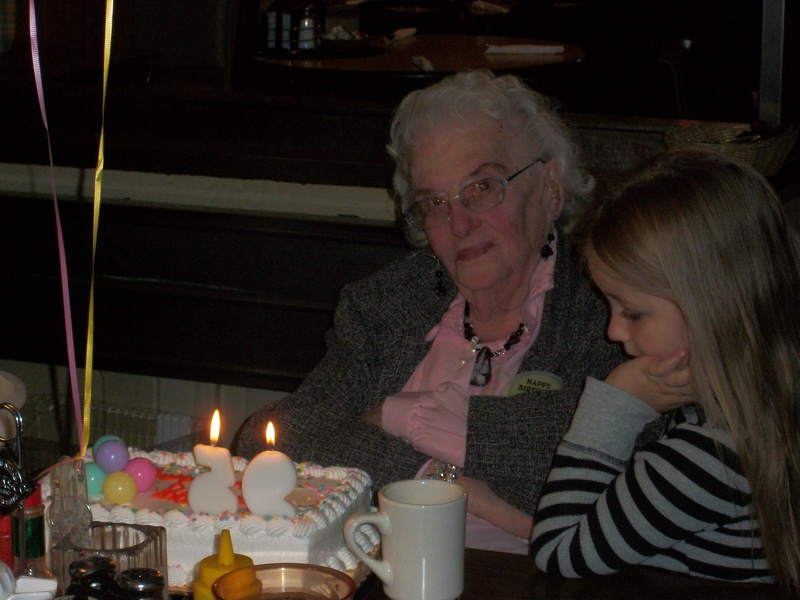 Back in September, we helped Justin’s grandma ring in her 95th birthday. This past Tuesday, she went to sleep for the last time. She was 95, lived alone & received only minimal help from family & neighbors because she liked to do it all on her own. She woke up every morning, dressed herself up, put on her make-up & enjoyed whatever the day brought. Of course some of those days only involved watching tv or quilting. Some of those days involved catalog shopping. Many involved visits from family & friends, for whom she always made a meal. It is believed that she knew her last days were drawing near, as she made comments about “when I’m gone” that she’d not made before. She made a visit to the local funeral home recently & updated her funeral wishes. She apparently had taken the time to sort through some belongings in recent weeks, as her two remaining children found trunks in the upstairs bedrooms with their names on them. These trunks had not been “named” a couple of months ago. Rather than turning off the kitchen light as she did every other night, she left it on the night she went to sleep forever, maybe as a way of notifying the neighbors. Grandma Elsie did not have an easy life but she had a good life. She dealt with tragedies and sad days just as any other person does but she enjoyed her life. She celebrated her life. Her last wishes were that we all would celebrate her life too, rather than mourn her death. Yesterday we gathered with many friends & family and celebrated the life of Grandma Elsie. All 95 years of it. The service was quiet & peaceful; a simple photograph placed next to a candle & one of her favorite angel statues were there for friends to view. She wanted no flowers, rather donations be made to the Lutheran School down the street. She was cremated & wanted no fuss over an urn or ashes. Numerous quilts that she made over the years were displayed, along with a favorite story of hers that hung in her house for years. There were tears, yes. But more than that, there were memories recounted, stories told & love shared. Death never comes at a convenient time & some deaths are far more unexpected & tragic than others but there is no reason not to celebrate life. Not just when it comes to an end, but every day. Whether we’re given 95 years or a shorter time on this earth, it’s important that we remember not to sweat the small stuff, stop and smell the roses, and celebrate life every.single.day.